The Scharzhof. Photo by Andreas Durst. Editor’s note: The historian Franz Irsigler gave me permission to publish his text on the Scharzhof in English. He will finally be moving back to the Falkensteinerhof after the fire on December 18, 2014, when he and his wife lost their home. Thousands of old books and other publications, including many on the wines of the Saar and Mosel, went up in flames. Fortunately, they made it out alive. The following is adapted from an essay that he published in 2015. It includes references and footnotes. Viticulture was introduced on the Mosel, Saar, Ruwer, and Lieser valleys in the second century and experienced its first peak in the fourth century, prompted not least by Trier’s function as an Imperial residence since Constantine the Great and the Roman soldiers’ thirst for wine. There are no written records from this early period, but archaeologists, particularly Karl-Josef Gilles, have found no less than 20 Roman wine presses on the Mosel—a wine press will soon be found on the Saar. A small artifact, a special winegrowing knife (similar to a twine knife), proves that wine was also made in the Konzer Tälchen (the “little valley” of Konz) in the fourth century. In the area around Wiltingen, the existence of at least three Roman villas, or farmhouses, have been verified, and viticulture probably took place there; and if it is correct that the origin of the Flurname (“field name”) Schartz—as it was still known around 1800—comes from the Latin sarta or sartum, which means “cleared woodland,” then grapes were harvested from the slope of the Scharzhofberg already in Roman times. The conditions for establishing a vineyard were ideal; recent viticultural research describes the core section of the Scharzhofberg, an area of about 18 hectares, as a “top site with an optimal microclimate, location, insolation, and soil quality.” The soil of the Scharzhofberg consists mostly of Devonian weathered gray slate, which stores the heat from the sun very well. It cannot be ruled out that the Scharzhof was already a part of the Benedictine Abbey of St. Mary ad Martyres (today’s Exzellenzhaus in Trier), which was founded around 700. Other researchers suspect, instead, that it was a donation from the Bishops of Trier Theoderich and Egbert after the Norman attack in 882, when Trier suffered heavily. Archbishop Poppo, friend and sponsor of the holy monk Simeon, confirmed in a document, the abbey’s ownership of the church in Wiltingen and an estate with five farms (mansen), as well as a few meadows and land occupied by the feudal lord (terræ indominica), which could only be the Scharzhof. Further, Adalbero III of Luxembourg, the provost of St. Paulin in Trier granted the vicarial tithes and the right of patronage, powerful and financially important rights, to the Benedictine abbey. In the 1314 register, the field name Schayrth (in monte nuncupato schayrth) was recorded for the first time, when the canon Ulrich of Longyon, in Lorraine, donated four morgen (jurnalia) of vineyard (terrae vineate) to the abbey. In 1602, St. Mary’s (Kloster St. Marien) asserted to the Luxembourg government, who was the territorial lord in Wiltingen (which, together with Kanzem, had been an exclave of the Duchy of Luxembourg and surrounded by the Electorate of Trier since at least the 12th century), that it owned “above Wiltingen” a secluded winery or press house and the vineyard lands around it. Viticulture on the Saar suffered a great deal from the turmoil of the Thirty Years’ War and the raids by the French, Dutch, but also the troops of the Holy Roman Empire during the 17th and 18th centuries. Many vineyards were abandoned, covered by shrubs and trees, apparently the Scharzhofberg as well. In his book on the history of the Archdiocese of Trier, published in 1860 (and still worthwhile reading), Jakob Marx wrote about the Abbey of St. Mary: “One of the abbey’s estates has achieved a widespread reputation in the last decades of its existence, and in recent times; we mean the Scharzhof, just outside Wiltingen. Until the sixties of the last [i.e., of the 18th] century, the abbey had Lohhecken [coppiced oak] on the [south-facing] hillside, which now provides the famous Scharzhofberger wine. One day, the abbey butler, the cellarer, went up to Wiltingen and asked the tenant farmer to report on the condition of the various properties. Once the tenant had finished his report, he added: ‘Father! Over there, we have a hill, which is better suited than for Lohhecken.’ Surprised about his comment, the cellarer asked the tenant, ‘What would you like to do with it then?’— ‘A vineyard, the best in the world,’ was the answer. ‘Allow me, Sir.’— The tenant continued — ‘to grow only a small strip on half of the Schar, and the wine will prove that I am right.’ The request was granted, and as the Father tasted a sample of the first wine from this site he exclaimed: ‘this is no wine, it is sugar with all the deliciousness, which nature may produce.’ As a result of this, the Lohhecken were transformed into the now so famous Scharzhofberg. This happened in 1767.” So, the "Schartz" had earned its Roman name sarta for the second time. 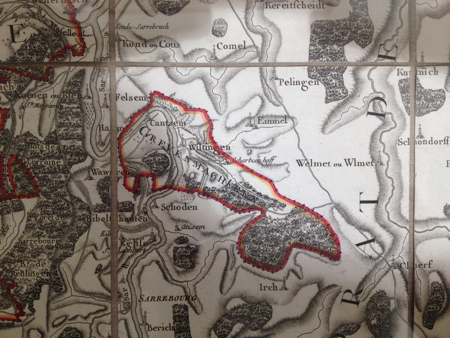 It is more likely, though, that the productive area on the Scharzberg (in this instance, the name of the hill that includes the Scharzhofberg vineyard) was only extended and systematically planted to Riesling in the second half of the 18th century. If viticulture had not been carried out to such a considerable extent, there would not have been a need to construct the splendid house for the steward or the manor with a beautiful Baroque staircase above a large cellar with room for allegedly 80 Fuder in 1719, where the date of the building is on top of the entrance. Since 1851, it belongs to the Hohe Domkirche (Trier Cathedral), a part of the Bischöfliche Weingüter Trier today; the wines are still vinified at the Scharzhof, but are cellared and sold in Trier. One knew at St. Mary’s what a gem the Scharzhof was. When France, in the framework of its annexation of the Austrian Netherlands, which also included the Duchy of Luxembourg, transformed it into the département des Forêts on October 1, 1795, the property of the Church and the nobility was immediately sequestered in order to at least partly cover the outstanding debt of 400 million livres by selling the assets; the Republic was bankrupt by September 1797. In the four (German) departments on the left bank of the Rhine, which were founded and fully annexed to France in 1797, this process started only in 1803. Wiltingen, with Scharzhof, now belonged to the canton of Grevenmacher and the arrondissement of Luxembourg; it remained an exclave of Forêts. When the French troops occupied the Rhineland in 1795, most clergymen and many members of the nobility fled to the unoccupied area on the other side of the Rhine, half of the 16 Benedictine monks of St. Mary’s did as well. Later in 1795, there was a rumor that the French would render back sequestered property to the monasteries; this motivated the Abbot of St. Mary’s, Placidus Mannebach, and his cellarer to travel to Trier in order to have the support of the city administration to supplicate the Director of the Administration de l’Enregistrement et des Domaines in Luxembourg to reverse the sequestration of the abbey’s property in Forêts. Attached to the letter was a list of 28 objects, in which the abbey presented numbers 27 and 28 as its most important assets: No. 24 was une vigne nommée Scharz, with an area of 30 morgen and 46 rods. If one assumes four morgen to the hectare, it was an 8-hectare vineyard. No. 28 mentions under the “Schartz”: a house, a barn, and a stable; also 10 morgen and 120 rods of fields; 8 morgen and 89 rods of arable land; and, finally, 4 morgen and 96 rods of gardens. Altogether, it was a magnificent estate. The hopes of the abbot and his cellarer were not fulfilled because the French governor, General Hoche, did not honor his notification to return the property. 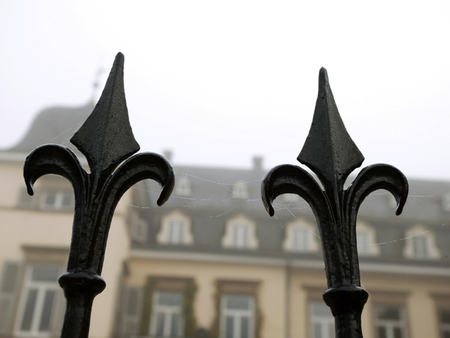 Meanwhile, French soldiers had looted the Scharzhof, as well as other Church and monastery property in Wiltingen, all instructed by the government commissioners Perrot and Morelle, who made an inventory of furniture, machines, equipment, and valuables, in part, to auction them and to send to Paris. When the Wiltingen inhabitants learnt that the French planned to loot their church, they cleverly brought away all the jewelry at night, hid it in their homes, and brought it back to the church once the French had left. That church does not exist today. The current place of worship is a new building from 1909. The young people of the village continued to cultivate the land of the Scharzhof property as long as the monks were away on the right bank of the Rhine. In 1795, when the sale of nationalized property began in Forêts, France had also changed the monetary system: they replaced the livre with the franc, a medium-weight silver coin of 4.5 grams, which remained stable until 1813–1815. The failure of the letter of request from 1795 apparently gave Abbot Mannebach another idea on how to secure the Scharzhof as an abbey winery after French rule. He obviously did not believe in a lasting existence and a full integration of the departments on the left bank of the Rhine with France. Here are the facts. In 1796, Abbot Mannebach sent his prior—he is number two in the monastery hierarchy after the abbot—Johann Jakob Koch (Johann was his monastic name, Jakob or Jacques his Christian name), who had his full confidence at that time, to Wiltingen in order to support the parish priest Franz Flander, who was advanced in years and not very well. Koch took up quarters in the abbey’s press house Mergen, nearby the church. The parish priest died in 1797, and Koch inherited his position. Already as the chaplain, he had probably recruited Anna Maria Clomes as his housekeeper. She was the daughter of a notary and lawyer from Bastogne, in Wallonia, born in 1775 and clearly younger than Koch, who was born in 1762 (baptized on September 16), and undoubtedly a very attractive woman. Schauffler reports that the prior and parish priest was born in Prüm in the Eifel; he must have had a strong command of French, which turned out to be extremely useful in the negotiations with the French administration in Luxembourg City. Dean Schauffler comments in his chronicle that the abbot had given Koch a considerable sum of money in 1798 or 1799 with which the Scharzhof was to be purchased and is convinced that Koch planned from the very start to keep it for himself. Altogether he paid around 6,000 francs for the Scharzhof. Thomas Müller rightly challenges the date; the purchase took place on July 29, 1797. He has also good reasons to doubt the sum of money mentioned by Schauffler. The auction protocol shows a considerably higher price for the Scharzhof. Further, Thomas Müller dismisses Schauffler’s story that Koch had French gendarmes to chase away some members of the Order who had food and board at the Scharzhof as a legend. In the end, the parish chronicle was written a good 100 years after the events. In addition, he says that Koch did not receive any money from the abbot, but had to make use of his own funds and credit. To support this argument, he refers to two bonds issued on July 29, 1797, each at 3,870 livres—i.e., francs—so Thomas Müller does not consider that more than 7,740 livres plus an interest of 5 percent per annum, documents which the Egon Müller family keeps at the Scharzhof. One of the credits had a maturity of two years and the other one three. Down payment on the purchase was 645 livres per bond, in total 1,290 livres. We do not know for sure whether the total sum actually was 7,740 livres, since Thomas Müller bases his argument on the credit guidelines, which came into force as of 1803 in the four departments on the left bank of the Rhine. It is indeed possible that the value of the first two-year bond amounted to 3 x 645 livres, the second to 4 x 645 livres, which would give a total of 4,515 livres net of interest. Three entries of receipts for the years 1798 to 1800 confirm that Koch made all the payments correctly; otherwise, he could not have had the bonds issued. Both papers counted only for the buildings and not for the land used for winegrowing. House, barn, stable, press house, press, and the lands are mentioned—i.e., the inventory in 1795. Koch must have paid cash for the vineyards by July 29, 1797, otherwise he would not have been granted the credit for the 4,515 or 7,750 livres. The last date of receipt from 1800 gives more credit to Dean Schauffler’s date, since Koch became the full owner of the Scharzhof once the bonds had been repaid. The entry in the mortgage register was then cancelled. Notwithstanding the long period of time between the events and the writing of the parish chronicle, which can easily be held against Schauffler, one has to bear in mind that he had access to information from trustworthy persons. According to Schauffler, Koch left the Benedictine order in 1799. Already at the time of the purchase in 1797, he calls himself only Jacques J. Koch, resident of Wiltingen, without any reference to his status as a monk or a priest. Shortly afterwards, he also gave up the office as the parish priest, since he married his charming housekeeper in 1801, then 25 years old; who until 1818 gave birth to eight children, two sons and six daughters. The eldest son, Joseph (b. in 1803) was apparently not fit for becoming a winegrower and died already in 1851. The second son was Peter Jakob (b. in 1812), who at the age of 27 shot himself in the head. The fourth daughter, Elisabeth (b. in 1810), married Felix Müller, the founder of the Müller winegrowing family, and died in 1888. Schauffler could, by all means, have talked to her. On the other hand, we can be quite sure that he spoke to Koch’s youngest daughter, the unfortunate Susanna Clara Koch (b. in 1818) about the history of the Scharzhof. She founded and gave the initial donation to the Benedictine monastery—today called Bethanien—in the Gartenfeld district of Trier. She was not allowed to live in her monastery in 1888 and died old and ill in 1906. Also Egon Müller I (1852­–1936), the most important grandchild of Koch’s, was undoubtedly very well informed about the family history. It remains unclear whether he told everything he knew to the author of the parish chronicle, if he showed documents like the bonds, from which Schauffler perhaps could have deducted the purchase price of 6,000 livres. After he had given up priesthood and married, Jacques Koch succeeded very quickly to become the mayor of Wiltingen and to intensively take care of the extension of the Scharzhof. He had a good position in the Forêts department thanks to his fluency in French. But not all civil servants liked him. One of them—and I now come to the documents found in Koblenz, although sparsely recorded, but not assessed up until now, not even by Thomas Müller—was Louis Joseph Belva, the Receveur de l’Enregistrement (collector of registration duties) in the canton chef-lieu Grevenmacher; Wiltingen was also under his jurisdiction. He probably received the payments in the period from 1797 to 1800 from Koch ex officio, and followed Koch’s career as mayor, family man, and estate owner closely. On November 9, 1806, he wrote a letter to the director of the administration of domains in Luxembourg, Monsieur Harmand, and drew his attention to the following fact: the Hospice Civil in Luxembourg had declared, by letter dated October 25, 1806, that Mr. Koch, mayor of Wiltingen, had very recently paid 8,000 to 9,000 francs to the hospital, which had been entrusted with him by the abbot and cellarer of St. Mary’s of Trier. Unfortunately, Belva neither received the declaration nor did he record its date. He had doubts that the Hospice administration was entitled to accept such large deposits and it was also obliged under the Imperial decree of January 23, 1806 to report on it. It was necessary to gather information about the subject matter and make the most possible and accurate investigations. The director was to ask Belva’s colleague in Luxembourg, the responsible collector, to submit a copy of the official notification that had been issued to Jacques Koch at the time in question. Belva’s colleague in Luxembourg, Baudol, responded, however, by letter only on March 9, 1808: a member of a religious order in Trier had acquired a domain, an estate for 8,000 francs, which the monk Koch had bought “with the money (no sum mentioned) of his community, and had appropriated it afterwards.” The source for the Scharzberg purchase becomes clear, but not the exact sum that Koch had been entrusted with. The judgment that he had appropriated the estate later on seems tough. Belva had already sent a second letter on February 14, 1808—three pages long, with a very detailed description of the matter—to the superior of the director, since he, now a certain Mr. Pruneau, had not reacted to the first one. He started with a reminder of his letter dated November 9, 1806 and the civil hospital’s investigation, where Koch had by proxy of the abbot and the community of St. Mary’s deposited about 8,000 francs. Since the Middle Ages, hospitals were engaged in some banking functions, especially smaller loans; another example is the St. James’s Hospital in Trier, which was described (in a book) a few years ago. I assume that Koch already received the money according to the abbot’s Plan B in 1796, and that he deposited it shortly thereafter at the Hospice Civil until it would be possible to buy the sequestered property. Then he made the withdrawal. The director of domains did not take any action against Koch. After an internal discussion in the Domain Directorate in Luxembourg, the legality of the purchase was acknowledged. The abbot and the last 15 monks had been compensated in 1803 with passports and modest pensions. Director Pruneau noted in a draft letter to Belva on March 9, 1808: “I do not think, Monsieur, that neither party in this case could claim a negative outcome.” The skillful mayor, who made such a good wine, was apparently more important to him than the devout and fault-finding collector Belva from Grevenmacher, who took pity on the poor monks. In many places still today, it can be observed that the powerful easily stick together and are reluctant to dispense with money already received. Jacques Koch succeeded. His transaction was unaffected by the French administration decree of November 24, 1797, which retroactively invalidated all past pledges and sales of the former owners until 1794; he had acquired the sequestered Scharzhof from the Directorate of Domains (the French authorities) and had, in this way, safeguarded his acquisition very well. Fortunately, two auction documents from the Forêts administration have survived in the state archives at Koblenz concerning St. Mary’s earlier possessions in Wiltingen, hitherto not marked under the Scharzhof, because the estates were actually designated together as “Mergen” in the French records. The original designation was then applied by the archivist Wolfgang Hans Stein, responsible for the Forêts inventory, so searches in the archives for the Scharzhof did not return any results. According to Mr. Stein, only Dr. Udo Fleck, the editor of the book on Mosel wine chateaux mentioned above and yours truly had seen these documents. I got the tip when I was researching for the former Jesuit property in Mergen. It was purchased in the early 19th century by Gustav Vanvolxem, a wealthy Trier beer brewer, grain merchant, and army supplier. Along with this property, next to the new church in Wiltingen, lies the Mergen press house, in which Jacques Koch lived when he was the chaplain between 1796 and 1798. Jacques Koch, recorded as “citoyen Jacques Koch, ecclésiastique et habitant à Viltingen,” actually bought at auction the Mergen estate, divided in two lots; the first was the Scharzhof, for which he paid 36,100 livres; the second was the Mergen press house in the village of Wiltingen for 9,000 livres; in addition, there were the administrative charges of some 250 livres. He was awarded both items on July 24, 1797, just a few days before the purchase date on July 29. Competing bidders at the three sessions were a certain Boucon, who first bid 9,000 then 11,000 livres, Mathieu, who bid 9,500 livres, and Dominique Reuter, who first bid 15,000 livres and then added 5,000 livres on top. Koch outbid them all with 36,000 for the Scharzhof. He wanted to play it “safe” on the third session. The description of both items is very precise; for the Scharzhof, the small St. Mary’s chapel is mentioned, but unlike the 1795 list, the protocol only mentions 20 jugera (Joch) of vineyard and a press house with three wine presses. The second item, the Mergen press house, counted 8 jugera of vineyard, also situated at the Scharzhof, so that the total of 28 jugera had almost reached the number of 30 from 1795. This would be 7 hectares. The press house in Wiltingen had two presses, plus there was a room, a restroom, and a kitchen on the first floor and six rooms on the upper floor. The sum of over 45,000 livres was only partly covered by the 8,000 francs from the monastery. Either Koch was granted an even higher credit from the Domain administration, covered by bonds, or he could borrow about 30,000 livres from friends and family. Jacques Koch got over the hardships of the first years quickly, including an attack on the lonely Scharzhof, which forced him and his family to move to Wiltingen. 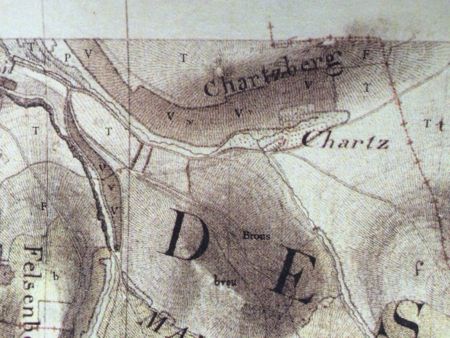 The Scharzhofberg was probably already planted to Riesling vines in 1797; since with Elbling (also known as Kleinberger) his wines would not have been categorized as top wines of the Saar and he would have never received the high prices per Fuder, as mentioned by Belva, which allowed him to pay off his large private loans. He must have managed the property very well and greatly expanded it, because, in 1831, a year after Koch’s death, the family already owned 16 hectares of vineyard, not barely 8 as recorded in 1795. A few years before he died, Koch had handed over the management of the Scharzhof to his son-in-law Felix Müller, a farmer’s son from Vöhrenbach, in the Black Forest. Like Jacques Koch, he had had an interesting career: born in 1789, he had joined Napoleon’s army, where he reached the rank of officer and participated in almost all military campaigns, and he was finally appointed Prefect of Police in Trier. He was a brilliant winegrower, but also an active writer. He wrote his memoirs in Italian; they have survived to this day and have been published. The Scharzhofberg. Photo by Andreas Durst. In the same year, Christian von Stramberg also ranked the “Scharzberger” one-third higher than von Handel’s Grünhaus from the Ruwer, which once belonged to St. Maximin’s Abbey, a Benedictine monastery in Trier. In 1834, 100 Friedrich d'or are supposed to have been paid for a Fuder (in this instance, 850 liters) of “Scharzberger.” The Friedrich d'or, better known as the Prussian pistole, was a heavy gold coin with a weight of 6.032 grams, the equivalent of about 16.89 Goldmarks. In other words, the Fuder was worth 603.2 grams of gold—that is 19.3 troy ounces, which today is about $1,200 each. The Fuder price was $23,160. This finding is supported by a price list of a wine merchant from Alf on the Mosel, who apparently delivered wines from the Saar, Ruwer, and Mosel to Cologne by sailing ship. I learned about this from the local historian Karl-Heinz Zimmer from Oberbillig, who was recently honored for the fine exhibition “2000 Jahre Schiffahrt auf der Mosel” (2000 Years Shipping on the Mosel) in Trier. Around 1850, Anton Nollen from Alf had an extensive wine list, in which the wines from the Middle Mosel were clearly ranked behind those from the Ruwer, the Olewig Valley, and the Saar. The most expensive wines per Fuder came from Friedrich von Handel’s Grünhaus (420 Prussian thalers) and from von Nell’s Tiergarten in Trier-Olewig (460 Prussian thalers). These were high prices; because the thaler had a weight in silver of 16.704 grams. The first Fuder was, in other words, worth 7 kg of silver and the second 7.7 kg. Nowadays, silver is trading at 430/480 euros; one has to bear in mind that the gold-to-silver ratio is 1 to 70 up to 78. In 1850, it was between 1 to 15 and 1 to 17. Silver had a considerably higher purchasing power back then compared to today. Nollen only sold Scharzhofberger in liter bottles, for 60 groten, with a thaler rate of 1 to 70, it would be 0.857 Prussian thalers. A bottle of Ausbruch was even more expensive—this is the oldest record of an Auslese that I know of—namely 1.029 thaler. Projected for a Fuder of 850 liters, a normal Riesling Fuder would have fetched 728 thaler, while the Auslese Fuder would have fetched 874. The greatest successes in the period around 1900 are well known: the wines from Egon Müller’s Scharzhofberg won first prize at the Paris Exposition Universelle in 1900, St. Louis in 1904, and Brussels in 1910. At the Trier wine auctions at the Saal des Katholischen Bürgervereins (hall of the Catholic civic society), which are very well documented, prices reached around and sometimes above 10,000 Goldmarks (i.e., more than 3.584 kg of gold) per Fuder, or 975 liters; that would be more than 120,000 euros today. Under the “regime” of Egon Müller I (1852–1936), son of Felix Müller and Elisabeth Koch, all-time high prices were reached at auction: in 1896, 10,500 Goldmarks for a 1895 Scharzhofberger; in 1897, a Fuder of the 1895 Scharzhofberger fetched 9,000 Goldmarks; in 1906, Scharzhofberger was auctioned for 10,020 Goldmarks; and the 1911 Scharzhofberger sold for even 10,600 Goldmarks in 1913. These wines were drunk at the imperial courts in Berlin and St. Petersburg. The high income allowed Egon Müller I to build the new chateau-like Scharzhof already in the 1880s and then also the fine villas “Probert” (for himself) and “Felicitas” (for his son Felix) in Wiltingen. The motto on the house is very beautiful: Hic habitat Felicitas—nihil malum intrat (happiness lives here—enter shall no evil). The only thing that probably annoyed Egon Müller I was that Freiherr von Stumm-Halberg and his son-in-law Conrad von Schubert received even higher prices for their Fuder in 1896 and 1913; 12,750 and 13,020 Goldmarks, respectively. With Egon Müller I, the Scharzhof made it through the First World War and the Great Depression fairly well. As of 1936, his son Egon II (1887–1941) was first in command; after his fatal tractor accident, his widow led the business until Egon Müller III took over in 1947 and brought it to new prosperity. It was he who invited the group of students who wrote the book on Mosel chateaux, to a fine tasting and happily answered all sorts of questions. Only he did not speak about Jacques Koch. The Egon Müller dynasty is still alive and diligent. After Egon IV, Egon V has taken the helm, with a total of 8.5 hectares in the Scharzhofberg. Egon VI is already 16 years old, but at the moment more interested in apiculture and honey production than winegrowing. Following the shadow cast by Jacques Koch on the Scharzhof, we should deal briefly with the youngest daughter, Clara Koch, to close the circle. Because she could not stand what her father had done, she sold her inherited portion in 1851 to the Trier Cathedral for 24,900 Prussian thalers (416 kg of silver). As mentioned above, her brother Joseph had died in the same year, and his portion had already been auctioned to the Cathedral for 18,512 thalers. These prices underline yet again the high purchase price of 1797. With the proceeds from the sale and the support from the Benedictine nuns of St. Nicolas-de-Port (near Nancy in Lorraine), Clara founded the Monastery Perpetual Adoration in Trier-Gartenfeld, joined the monastery as a nun with the monastic name Mechtilde, and built a living space and a chapel there, which consumed the largest part of her wealth. Since there were no Benedictine monks in Trier anymore, very poor and pious Benedictine nuns would at least receive something from the possessions of St. Mary’s. The foundation was a success, but during the Kulturkampf (1871–1887) all monasteries, which did not provide nursing or schooling, were dissolved. Clara-Mecthilde’s religious sisters fled to Luxembourg. The founder of the monastery hoped for better times, went back to laity, and stayed alone in Gartenfeld, which had been acquired with her inheritance. After the Kulturkampf had ended, the sisters came back in 1888 with a new prioress. Clara wished to renew her vows, but the new Bishop Korum did not allow her to rejoin the monastery; he did not even allow her to live within its gates. She was a daughter of a priest and would have had to obtain—like sons of priests who wanted to become priest themselves—an expensive Papal exemption. But she had run out of money. She had fallen out with her family in Wiltingen, so, old and ill, she tried to survive in a flat near the monastery. The bishop took away her inheritance in a similar brutal fashion as her father did to the monks of St. Mary’s with the Scharzhof. This also casts a dark shadow on the Trier Cathedral. Translated, from the German, by Per Linder. More on the Scharzhof: Per Linder on the Scharzhof transaction and a supplement to the biographies of Jakob Koch and Anna Marie Clomes. Per Linder works in asset management; he lives in Luxembourg, not far from the Hospice Civil, with his wife and two children. Depending on the source, Jacques Koch is also named Jean-Jacques Koch or Johann Jakob Koch. The "new" Scharzhof, where Egon Müller and his family lives, was first built in 1890 and rebuilt in 1917 after a fire. The original Scharzhofberg didn't include the upper part of the Scharzberg hillside, including the area around the peak, known as Pergentsknopp. This section was planted later and use to be a part of the pre-1971 Scharzberg vineyard. The old Scharzberg site was just to the east of the Scharzhofberg on the way to Oberemmel. The post-1971 Scharzhofberg includes Scharzberg. As if to confuse matters more, old references sometimes refer to the Scharzhofberg as "Scharzberg" (see "The Nearly Forgotten Scharzberg" for more on this). In the late 19th century, the Scharzhofberger wines from the former Apollinar Koch estate, based in Wiltingen, were often more expensive than Egon Müller's. Apollinar Koch was the son-in-law of Jacques Koch. The Apollinar Koch vineyards are now owned by Reichsgraf von Kesselstatt. The Benedictine monastery also owned Maximin Grünhaus and what is today Weingut von Hövel, plus many other vineyards on the Saar and Mosel. Along with the Trier Cathedral and the Cistercians at the Himmerod Abbey, the Benedictines were very important to winegrowing in the region. Only the original arch remains of St. Maximin's Abbey in Trier; the Tholey Abbey in the Saarland was ransacked and burned down during the French Revolution. Balduin of Luxembourg, the Archbishop-Elector of Trier, gave the Carthusians the land in Eitelsbach, along with property in Trier. In 1674, the French destroyed the Carthusian monastery of St. Alban in Trier and other monasteries just outside Trier's city walls. Afterwards, the Carthusians built a new monastery further upriver on the Mosel in Merzlich (now called Karthaus). St. Matthias' Abbey in Trier owned other top sites on the Saar and was formally called St. Eucharius, after the first Bishop of Trier, whose tomb is in the crypt. St. Matthias' Abbey, which was reestablished in 1922, can trace its origins back to one of Germany’s oldest monasteries, named after the first Trier Bishop Saint Eucharius, who died there around 250. When the relics of the Apostle Matthias were found in 1127, the old name was replaced. The Euchariusberg vineyard in the Konzer Tälchen must have been planted to vines in the Early or High Middle Ages. Hi Andrew, glad that you liked Franz’s article. I really enjoyed translating it. We completed the harvest at Hofgut Falkenstein on November 4, picking the last Riesling blocks in Oberemmeler Karlsberg and Krettnacher Euchariusberg. Franz recently moved back to the Falkensteinerhof. On November 3, he and I also attended Daniel Deckers’s lecture on Tranchot and the various maps of the Rhineland under French and, later, Prussian rule. The other day, it occurred to me that if Egon Müller owned all of the Scharzberg, he would be close to the same size as Maximin Grünhaus and also have a complete hillside in his possession.